I tried some stitch combinations today. 2.The first row is a combination of this stitch with Italian border stitch and pistil stitch. The sailor edging stitch slips inside fly stitch to form loops in the second row. 3.This stitch is worked with herringbone in the first row. I whipped around small straight stitches to work this second row of sailor stitch with French knots. 4.Algerian eye stitches with a variation of sailor edging stitch. 6.In these samples Pekinese stitch and buttonholed herringbone are worked with sailor edging stitch rows. 7.oyster stitches and triangular feather stitches are worked in the first row. Arrow head stitches and wheat ear stitches are worked in the second row. 8.I tried some shapes with this stitch, the buttonhole eyelet stitch in the centre is whipped . 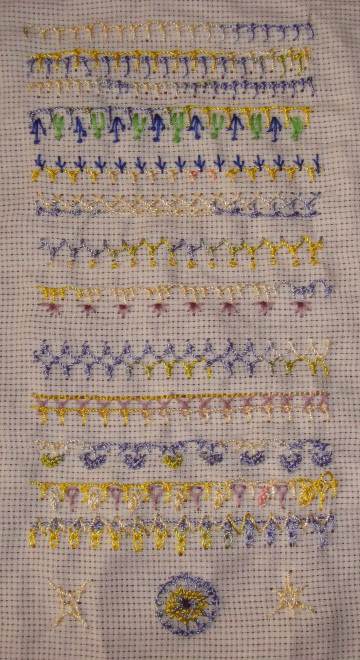 With these samples the sailor edging stitch sampler is completed. It is easier to control the thread tension and twists with this stitch. So it better than basic buttonhole and knotted buttonhole. It looks more attractive too. This week, sailor edging stitch was also announced on the TAST 2013 stitch challenge by SharonB. This has common elements of sailor stitch and knotted buttonhole stitch. I started working on this stitch today. The first row, I wanted to work the buttonhole stitches loose to make it look like loops, but couldn’t manage it. Two rows sailor edging stitches are worked one over the other in the second row. Long and short buttonhole stitches are worked in the third row.